This set includes La Bella's amazing wound Low G string which adds lots of tonal warmth, depth and power to your concert or soprano ukulele. The c,e,a strings are the same fluorocarbon strings found in set US1. This set will also work for a baritone ukulele tuned d,g,b,e. Excellent customer service and my order arrived in a timely manner. 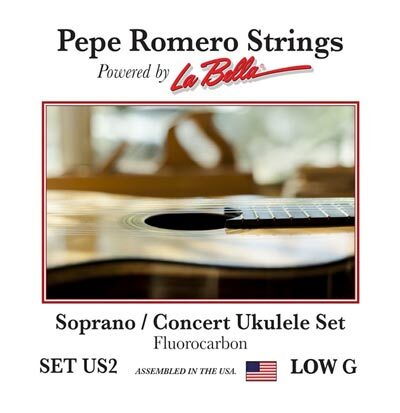 I had been searching everywhere for Pepe Romero strings, was so happy to find them! Love these strings. The sound is just great. The wound low G is truly smooth - no squeaks - and thin enough to be put on a regular reentrant tuned uke without filing the nut slot. My order arrived in several days.In Hawaii that's quick,also they offered strings I could not find else where. Q: Can you confirm that these are the right length for a Baritone ukulele? Would it be better to buy the Aquila Lava Baritone D,G.B.E strings instead. A: Yes it would be best to but an actual Baritone set.